Once a relationship is over, the only thing to do is to move on. This is especially the case when your ex-partner is in newly in love with someone she’ll never tire of. However, this guy is devastated and he keeps reopening the wound by continuing to look at them when they are making out. The only solution is to turn away from watching their public displays and focus on something else, or get up and leave. Unfortunately, he is hit over and over with waves of emotion and can’t break the cycle of hurt and sadness. 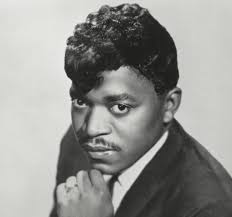 Between 1966 and 1969 Percy Sledge charted 17 songs into the Billboard Hot 100. Only one of these made the Top Ten. 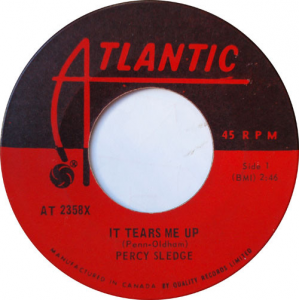 But in Vancouver Sledge had two #1 hits in 1966 with “It Tears Me Up” being the follow up #1 to “When A Man Loves A Woman”. “It Tears Me Up” also climbed to #1 in Charleston, West Virginia, #2 in Albany (NY) and New Orleans, #3 in Topeka (KS), Louisville, Pittsburg, Atlanta, New Haven (CT) and Tampa (FL), #4 in Dallas, #5 in Knoxville (TN) and Little Rock, Arkansas, #6 in Miami and Wilmington (DL) and #7 in Providence (RI) and Hartford (CT). The songwriters for “It Tears Me Up” were Dan Penn and Dewey Linden “Spooner” Oldham Jr. Penn and Oldham also wrote songs recorded by Arthur Conley, Joe Simon, Bobby Womack, Clarence Carter, Barbara Lynn, Etta James, Janis Joplin, Otis Redding, King Curtis and Bobby Hebb, among others. In 1960 Conway Twitty was the first to record songs by Dan Penn. In 1966 the success of his song, “I’m Your Puppet” by James and Bobby Purify convinced Penn he could make a career out of writing songs. The following year he wrote “The Dark End Of The Street” recorded by James Carr in 1967 and “Do Right Woman, Do Right Man” for Aretha Franklin. Penn also produced “The Letter”, a #1 hit for the Box Tops that summer. In 1968, Dan Penn’s song “Cry Like A Baby” climbed to #2 for the Box Tops. In 1967 Percy Sledge had another Top 20 hit in Vancouver with “Out Of Left Field”. He had four Top Ten hits on the Billboard R&B chart between 1966 and 1968. He released another eight singles between the end of 1969 and 1974. But only one of these cracked the Hot 100. Back in the USA, Percy Sledge’s concert tour was met with criticism as he was seen as violating the cultural boycott of South Africa. While others pointed to his being able to perform in front of both black audiences and white audiences as a possible sign of thawing in the hard line the government was taking. While performing in South Africa, Percy Sledge was allowed to stay at a all-white hotel in Cape Town. Harry Belafonte, Sammy Davis Jr. and Johnny Mathis were among the recording artists who were supporting the cultural boycott of South Africa. Percy Sledge recored a live album in 1970 titled Percy Sledge in South Africa. The album had an international release. Sledge also released a Christmas album in South Africa. In 2011 Percy Sledge toured with Sir Cliff Richard. During the tour the pair recorded a duet covering James and Bobby Purify ‘s 1966 hit titled “I’m Your Puppet.” In 2013 Percy Sledge was back on tour in South Africa. He also had regular concert dates over the years in the Netherlands. When he was 71 a concert set for Percy Sledge numbered about a dozen songs. He also was touring across the Deep South in the USA. In an interview in 2014 Percy Sledge told a reporter he went for a walk every morning in Baton Rouge at 5 a.m. He played pool and In 2015 Percy Sledge died of liver cancer at the age of 73 in Baton Rouge, Louisiana. Nick Hasted, “Music: Good ol’ Boys in the Hood,” Independent, November 5, 1999. Joss Hutton, “Spend A Little Time With the Old Folks,” Perfect Sound Forever, 1998.